Live Reader is a nice and simple Windows 8 RSS Reader app that can fetch content from multiple RSS feeds. In addition, it also provides you with an easy-to-read interface for reading content on webpages. The main highlight of Live Reader Windows 8 RSS Reader app is that it allows you to search for phrases and keywords across all included RSS feeds. This way it becomes a perfect choice for people interested in fetching latest information from different websites in same niche. On launching Live Reader for the first time, you will be presented the following interface. You will find a button stating ‘Add Feed URL’; click on it and a textbox will pop-up on the top-left section. Next, you need to type the RSS/Atom feed URL in the textbox and click on ‘add’ button. Then after a bit of processing a new button will be added on the home screen with a name fetched from the Feed URL provided by you. You can now click on that button and browse the latest posts from the site. Next, you can click on particular entry for further reading. At the end of the post you will find ‘View Article in Website’ button to open that page in default web browser. Also, check out our posts on PDF Reader App, eBook Apps, and News Apps. On the home screen exists the button to search the RSS feeds. Soon after which a small panel containing search box will appear on the screen. Then you require typing the phrase or keyword followed by a click on ‘search button’. Next, the matching results will be fetched for you. Now, click on particular entry to read page content. Upon right-clicking, a the horizontal panel will emerge at the bottom of application window. It contains a ‘hide icons’ button, which can be utilized for hiding those extra set of controls i.e. only, the icons representing the included RSS feeds will be visible. On another click; it will toggle and extras will become visible. To set the frequency for refreshing RSS feeds you will need to activate Windows Charms and select settings >> ‘Live Reader Settings’. There you will find a slider that can be adjusted as per requirement. (The app does not runs in background). Then click on ‘View in Windows Store’ button followed by a click on ‘Install’ button after being redirected. 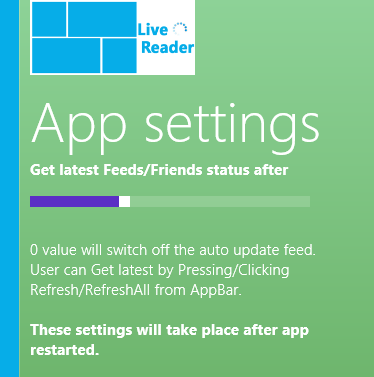 * Live Reader Windows 8 RSS Reader App is only 1.02 MB in size and requires permission to access your Internet connection. 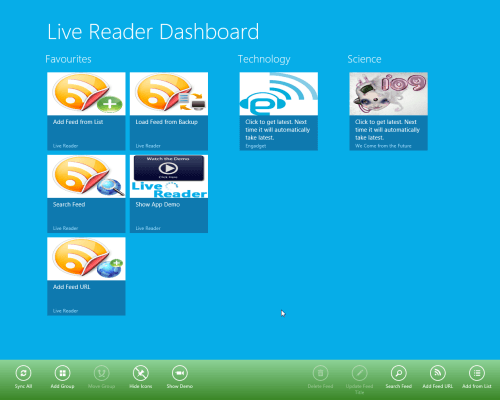 Live Reader Windows 8 RSS Reader delivers you a very nice user experience and no bug was detected on its evaluation. You can consider giving it a try.